Back in 1977, a really bad guy named Jean-Bédel Bokassa (1921-1996) had himself crowned Emperor of Central Africa. Among his accessories were a diamond-encrusted gold crown and scepter and, of course, an eagle-shaped golden throne that weighed 20 tons. We don’t know how much gold the throne contained, but news reports at the time claimed that the new Emperor had spent more than $20 million on his coronation, nearly bankrupting his impoverished country. Bokassa’s reign didn’t last long, possibly because he liked to kill his own citizens. He was overthrown after only two years, apparently with the help of French foreign agents. He then lived in exile in Libya and then France until he died, but apparently he left his gold throne behind somewhere. We’re not sure, but Bokassa’s throne might have contained more karat gold or gold alloys than any other piece of furniture ever made. Although chances are pretty slim that you will walk into an antiques auction and find it sitting there awaiting your bid, there really is a chance that you might come across an old piece of furniture that contains gold. Where? Let’s find out. During the 17th and 18th centuries – what is called the Rococo Period – a lot of furniture was made that had gold accents. Why? 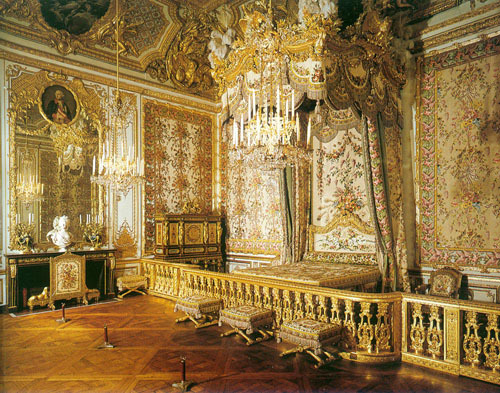 It was because another emperor, Louis XIV of France, had decorated his dream palace Versailles with all kinds of golden stuff like chandeliers, mirror frames, you name it. Golden furniture then became a craze in France because members of the growing middle class wanted to look like Louis. That fad spread to other countries, including England and America, where some gold-decorated ornate furniture was made. If you wander into an estate sale or antique store and find an ornate old piece of furniture with gold-toned decorations or hardware, chances are pretty good that those accents are made of bronze or another metal that has been gilded to resemble gold, or even painted. But you never know. If you can buy a piece of furniture that could be decorated with gold-filled or gold-plated accents, it could be worth recycling for its metallic value. Give us a call at 800-426-2344 and talk to us about it. Back in 1923, King Tut’s tomb was opened and his sarcophagus and other gold-toned stuff was removed. Mostly, it was covered with gold leaf. That discovery sparked a love of furniture and home decorations in a pseudo-Egyptian Art Deco style that favored gold accents. You might find some gold-toned items from the period, but chances are that it will be either covered in very thin gold leaf, or simply painted with gold-toned paint. (Gold-toned paint is not made of gold, it contains yellow lacquer and reflective metallic flakes.) In either case, it will not contain enough gold to recycle profitably. But again, you never know. Some furniture and home furnishings made during in the Deco style do contain enough gold to refine profitably. Again, give us a call to discuss what you have found. The message? All that glitters is not gold. But some stuff that glitters really is. If you want to know for certain, call us at 800-426-2344 and let us do the testing for you.